How long will my Wheat Design last? Is it durable? Our wheat designs are exceptionally durable. With proper placement, your wheat design will maintain its original appearance for years. Be sure to place the arrangement away from children, animals and fireplaces or open flame. If displayed outdoors, place the wheat design in a location that offers shelter from rain, snow and wind. . When the wheat design is moved or handled, some of the kernels of wheat and chaff may drop off, however, this will not harm the overall appearance of the design. How do I care for my Wheat Design? Little care is needed for your wheat design other than a light dusting from time to time. For best results, use a dry cloth or the soft head attachment of a vacuum to remove dust by gently swiping upwards from the base of the wheat to the tip of the wheat beards. Reshaping may be needed if the piece has been stored and appears flattened in a particular area. 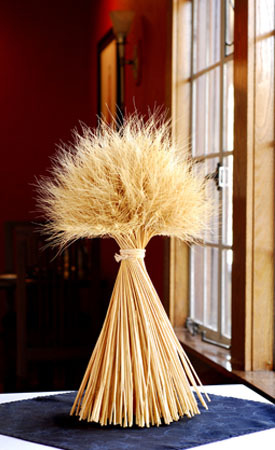 If needed, the wheat heads can be reshaped by spritzing them lightly with a fine mist of water. As the piece dries thoroughly, the wheat will fill back out to its natural shape. Was my wheat design sprayed with any chemicals? Our wheat designs are free of harmful chemicals. No part of the wheat design is intended for human consumption. Where is the wheat grown and where are the arrangements produced? Our wheat designs are made entirely in the USA, specifically Oregon. We use only wheat grown in our area, generally a soft white wheat which farmers like for its high yields and resiliency to disease and weather. Common varieties of soft white wheat we use in our designs are Stephens, Tubbs and DNS wheat. We have the unique opportunity and are grateful to agronomists at the Oregon State University test station for giving us access to new wheat varieties grown in their nearby test fields. One of the newest test varieties we have used is named Louise which is beautiful in our designs due the appealing length and shape of the wheat heads. What are some of the symbolic meanings of wheat? Wheat has had symbolic meaning for eons. Scholars believe that about 11,000 years ago people took the first steps toward agriculture and wheat was one of the first plants grown. A single stem of wheat, sheaf of wheat or bundle of wheat is associated with a long and fruitful life, bread of life, hope, thanksgiving, and prosperity to name a few.